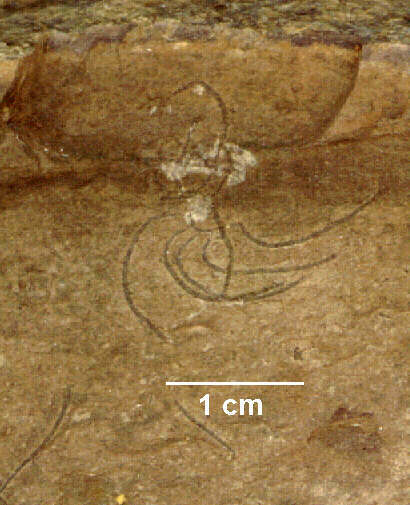 Following are graptolites collected from the Athens Shale formation (Ordovician age) near Montevalo, Alabama. 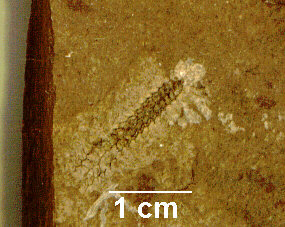 The Athens shale tends to be a nice formation for collecting graptolites, as the dark carbonized remains of the graptolite contrast sharply with the tan to cream colored shale. In fact, it seems that the presence of graptolites in the shale influenced the coloration, as there are darker colored shales near to the light colored ones, but the graptolites are often surrounded by a "halo" of lighter color even in the darkest of shales. 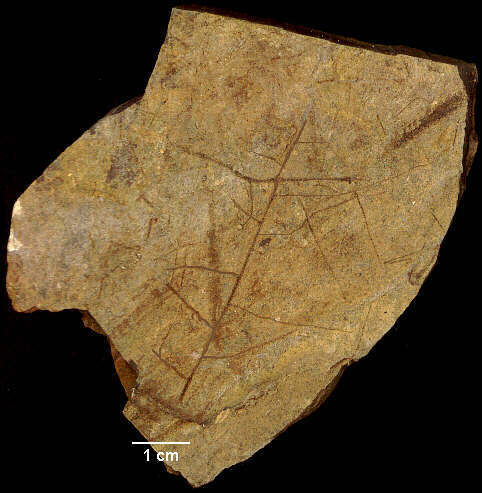 Graptolites (literally translated "writing on rock") are an extinct group of Paleozoic colonial organisms, most often found as thin carbonized films in various shales or limestones from the Cambrian to the Carboniferous. It is believed that they were either planktonic (floating) or benthonic (bottom dwelling) in habit. They are classified in the hemichordates due to their affinity to a modern group of hemichordates, the pterobranchs, and it is believed that they were filter-feeders as are their modern counterparts. An entire graptolite colony is termed a rhabdosome, composed of a variable number of stipes diverging from the initial individual of the colony, the sicula. 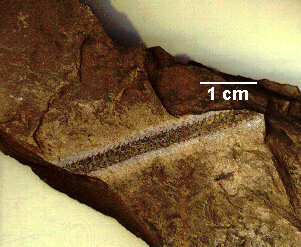 The small "sawtooth" like structures along the stipes are termed thecae (singular theca)--it is the thecae that housed the individual members of the graptolite colony. In some genera of graptolites, the individual stipes are strung together by a whip-like structure called the nema. Retiograptus geinitzianus. These have a somewhat unique appearance, seeming to be made of numerous hexagonal "bubbles" strung together. Isograptus lyra . One of several collected there. Isograptus has two very thick stipes with small whip-like projections by each theca. All in all, I find these to be very attractive graptolites. Diplograptus (Orthograptus) calcaratus. These are very common in the Athens Shale, second only to Climacograptus in abundance. The stipe has thecae running down both sides (termed biserial). Nemagraptus gracilis. 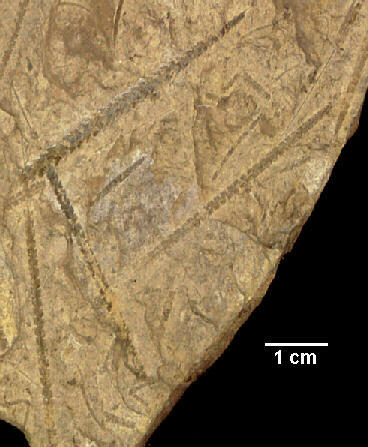 Nemagraptus illustrates a graptolite that ties together numerous stipes with a nema, hence its name. 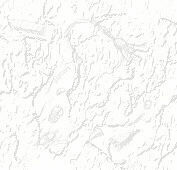 The images are arranged in ascending order by size from left to right. The first two represent the typical size of Nemagraptus specimens collected in the area with 8-12 stipes along a very small nema with the entire rhabdosome measuring some 1-2 cm across. The largest of the three (the one to the right) is a very large specimen, measuring some 4 inches across from "corner to corner", with around 35 stipes each about 2 inches long. It is certainly the largest I have ever collected, and appears to be larger than any I have seen illustrated in graptolite literature. 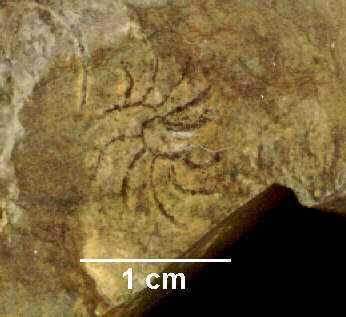 At the top of the piece of shale with the large Nemagraptus, close to the measurement mark is a Dicellograptus sp. Mastigograptus sp. 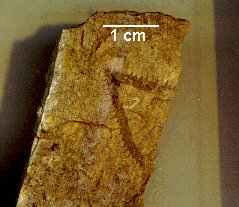 This graptolite illustrates a branching form. Climacograptus parvus. There are several specimens of Climacograptus (graptolites with squarish thecae) along with another specimen of Diplograptus calcaratus (graptolite with triangular thecae). Glossograptus (hystrix?). 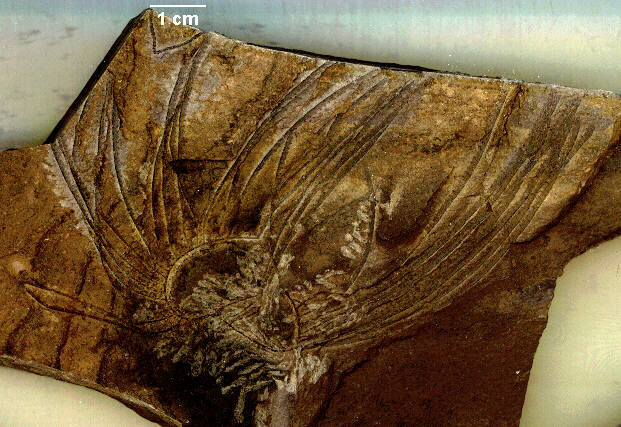 Perhaps my personal favorite graptolite (probably owing to their relative rarity at the Athens Shale site.) It consists of a stipe with a swollen part and long whip-like projections accompanying each theca. 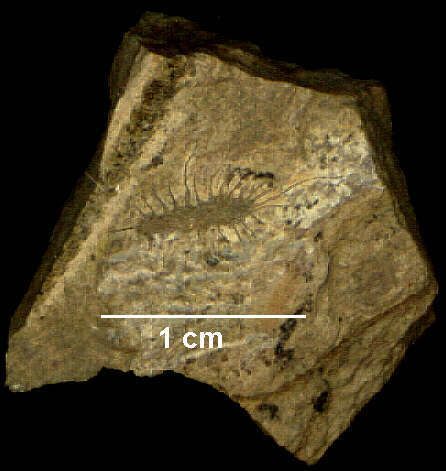 It shares the rock with a Climacograptus specimen (to the left).